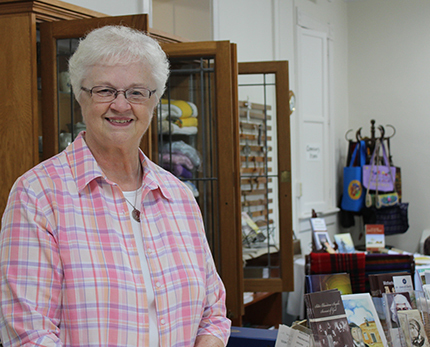 S. Mary Jo Gasdorf gives several hours each week to the Motherhouse Gift Shop, one of her many volunteer ministries. “I don’t know if I ever did retire from active ministry,” says Sister of Charity of Cincinnati, Mary Jo Gasdorf, as she speaks about her varied volunteer ministries. Ever since she retired six years ago at age 70 as director of The Women’s Connection in Price Hill (Cincinnati, Ohio), Sister has used her God-given gifts to continue to make relationships with others and to listen with her heart. S. Mary Jo spends most of her time ministering at the Motherhouse Gift Shop, and says she absolutely loves volunteering there with a group of five other Sisters. “It is such a fun place to be,” she says. It is a place where Sisters listen to one another and tell stories. She finds her volunteer ministries to be about making meaningful relationships with others and supporting each other. Similarly, volunteering at the Front Desk offers her the opportunity to greet new faces who walk through the door. As a vigil minister, S. Mary Jo understands the importance of walking with a Sister during this transition, though it can be very difficult for S. Mary Jo and the many other Sisters and Associates who partake in it. Sitting with a Sister who is dying, whether that is holding their hand, or just simply being there for them in that time, is something truly special and treasured for each vigil minister. When asked how her volunteer ministries connect to her former active ministries, S. Mary Jo said that listening to others with your heart has been essential to both. She said that the mission of the Sisters of Charity is having a loving trust that shapes all relationships, and she said, “I think everything I do as a volunteer is part of that.” With each volunteer experience, S. Mary Jo is able to develop new relationships, which is, “A wonderful opportunity to witness to who we are. We are a welcoming community and we are very happy,” she says. Volunteering strengthens her relationship with God because of the people she is able to interact with every day. Simply being present to others is a gift that she aims to utilize in every ministry she is a part of.